For my first beauty post, I thought I’d share with you a product I only started using recently but that has already become essential to my make up routine. 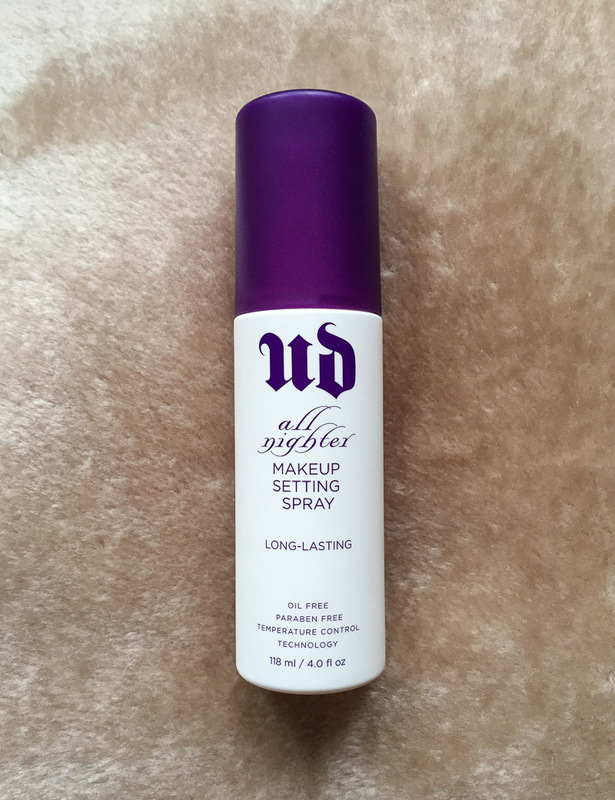 Urban Decay All Nighter Long-Lasting Makeup Setting Spray, £21, does exactly what its name suggests; it sets your make up and helps it last longer. I actually purchased this several months ago, but for whatever reason it ended up in the back of a drawer and I completely forgot about it. That was until a couple of months ago when we were painting our bedroom and I found it when sorting through things. I’d bought it after hearing so much about it and reading such favourable reviews. I’m all for anything that’s going to keep my make up looking good for longer, as I hate having to touch it up and reapply through the day. Despite this, I have to admit I was actually quite reluctant to start using it. Since my health problems began, my skin has become ridiculously sensitive and dry. With this product, it was the sensitivity that concerned me and I was worried it might make me break out or cause a bad reaction. But I decided to bite the bullet and start using it. Fortunately, my skin was absolutely fine and I haven’t had any reaction to it, which I’m very pleased about as I really love it. It truly does make a big difference. It sets my make up in place and it lasts a good amount longer than it usually would. Plus it keeps it looking freshly applied, which is surely what everyone wants. Urban Decay claim this will keep your make up looking just-applied for up to 16 hours- without melting, cracking, fading or settling into fine lines. I personally can’t say it lasts for anywhere close to 16 hours, but it certainly does make it last a lot longer. It does prevent fading, and it seems to reduce the amount of melting and cracking, albeit not stop it entirely. Make up settling into fine lines is a concern of mine, and I do feel this helps a bit, although not as much as I would have liked. But that isn’t why I got it; I bought it to extend the wear time of my make up, and it most definitely does that. To apply, you shake well, and then hold 8-10 inches away from your face and spritz 2-4 times. It’s recommended to apply in an “X” and “T” shape, and be sure to close your eyes before spraying. 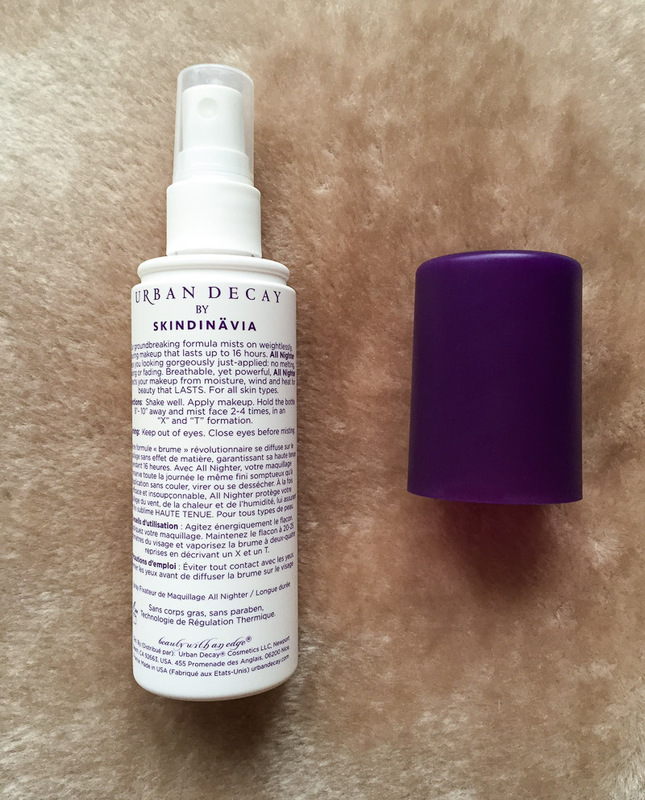 The spray is a very lightweight mist which is refreshing and it quickly settles. It has an oil and paraben free formula which has been clinically tested, making it suitable for all skin types, even sensitive skin like mine. And it also boasts to having patented Temperature Control Technology, which lowers the temperature of your make up (who knew that was a thing? ), keeping it in place regardless of weather conditions. Fancy, huh? This is definitely a product I recommend, and if you’re someone like me whose make up tends to fade quite quickly, then this is a must have.